Recently, a great Jackie Robinson item was sold on eBay. 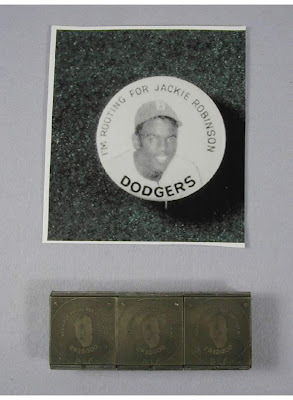 It is an original 1947 printing plate for the highly sought after "I'm Rooting for Jackie Robinson" pin. A mint version of the pin easily sell for $200.00 to $300.00 a piece, or more. This item sold for $495.00. That's not too bad considering it is probably one-of-a-kind and cost almost as much as an actual pin. During Jackie's rookie season, a series of celluloid pins were sold just outside of Ebbets Field. Vendors would be standing outside of the stadium holding a piece of cardboard with the pins attached. They would probably be screaming, "Get your pins right here! Jackie Robinson pins!" There two versions of the pin, one with a red border and another with just a white background. 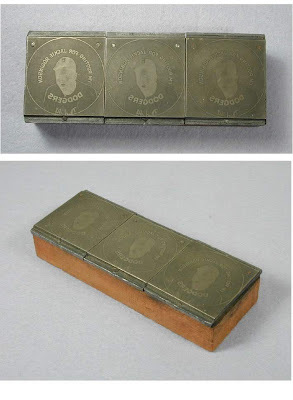 This printing block is for the white background version. Other pins include a "Brooklyn 1947 Dodgers Congratulations" pin, "Outstanding Rookie" pin and "19 Rookie of the Year 47" pin. To follow up on my last post below. On July 1, 1903 the The New York Giants performed a feat that has never been repeated. They completed Baseball's only quadruple play. Here is what happened. St. Louis had the bases loaded and no outs in the top of the 6th inning. Homer Smoot is up to bat and hits a shallow fly ball to centerfield for out No. 1. Giant outfielder, Roger Bresnahan, fires the ball to home plate to catch Clarence Currie trying to score on a sacrifice fly for out No. 2. Catcher John Warner then throws the ball towards secondbase to shortstop George Davis who tags out Patsy Donovan who is coming from firstbase. This is out No. 3. Davis, who must not have realized that 3 outs were already recorded, then throws back to the catcher who subsequently tags out John Farrell at home as he tries to score from secondbase. Of course, only the first three outs were recorded. As I'm sure you all know, the Dodgers lost to the Angels 6 to 1 yesterday. Furthermore, I'm sure you all know that the Angels pulled off their third triple play this Spring against the Dodgers. The unfortunate batter to start this rare feat was newly acquired Brady Clark. This event got me thinking, "how frequent is the triple play?" Well, the internet never seems to disappoint my curious mind. SABR has an excellent analysis focused on the triple play. Check out the link here. It's amazing the amount of information they provide. They have a complete listing of every triple play since 1876, a complete description of every triple play, triple plays by month and stadium, and much much more. I don't know how they find the time to figure this all out. The best part of the site is triple play trivia. Quadruple Play- Only the first three outs were counted - 7/1/1903 6th Inning - New York Giants vs. St. Louis Cardinals. The Detroit Tigers turned triple plays against the Boston Red Sox on two consecutive days (6/6/1908 and 6/7/1908). Detroit's Germany Schafer started both of them (once as a 3B and then playing 2B). Gavvy Cravath (Bos) batted-into the first one and was on base for the second one. Germany Schafer is also famous for stealing 3 bases on consecutive pitches without ever getting past 2nd base. On 9/26/1927 Washington Senators' batter Joe Judge hit into a triple play and was not charged with a time at-bat (Sacrifice Fly). From the guru of Baseball sports injuries, Will Carroll of Under The Knife, provides his opinion of Kuo's injury. He's been shut down with inflammation in his pitching shoulder. There's not much information beyond this, but the symptoms (inflammation and pain in the back of his shoulder) could be many things, from a cuff problem to a labrum tear to simple tendinitis. There's no use guessing here; the value is in knowing that he'll be shut down for much of April. Watch to see if he can get back to a throwing program by mid-month. If this stretches into May, we'll know it was one of the worse injuries. This is just hot off the presses. Ugueth Urbina, former Expos hurler and member of the 2003 World Series Champion Florida Marlins, receives a 14 year prison term in Venezuela. Apparently, he was involved in attacking five workers on his family ranch with machetes and gasoline. Yikes! Inside the Dodgers brings us the good news. The Garciaparra's have added two new members this morning. They are healthy bouncing twin baby girls. The 1983 Fleer Project is one of the more unique Baseball collector sites on the Internet. 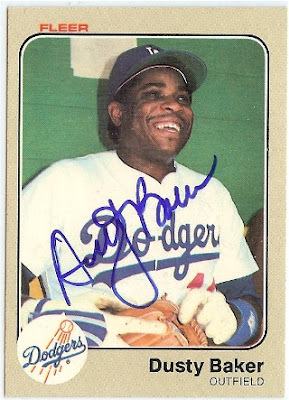 Have you ever written a player and requested that they sign a card for you? Have you ever thought about trying to complete a whole card set with autographs? Well, this guy is doing both of those things all at once. Kind of like killing two birds with one stone. No, exactly like that. He is trying to complete an entire 1983 Fleer card set with autographs requested through the mail. There are 660 cards in the entire set! As I write this it is the bottom of the 8th inning and the Padres are killing the Rangers by a score of 23 to 7. The reason I note this is that Gagne pitched 1 inning. Below is his pitching line for the day. Three of the hits Gagne allowed were doubles by D Macias, C Huffman and P LaForest. Yup, my thoughts exactly, who the heck are they? Fox Sports lets us know who are the top 10 "Must Stay Healthy" players this year. On their list is new Dodger Jason Schmidt. Schmidt's health woes are overstated in some quarters (he's averaged roughly 200 innings per season over the last five years), but he does have a history of arm trouble. The Dodgers won't have much of an offense this season, so they need Schmidt and rotation to live up to the press clippings. Let's hope that his lack of velocity this Spring is as normal as Colletti and Conte say it is. I've been a rabid Kings fan for almost as long as I've been a lifelong Dodgers fan. So, imagine my elation when I found out yesterday evening that heralded defensive college star Jack Johnson had officially signed with the Kings and would be joining the team this coming Thursday for a scrimmage against Vancouver. WooHoo! This guy can not only hit with the power and force of a young Rob Blake, but he can score like a Chris Pronger. A three-time CCHA Defenseman of the Week winner, Johnson set career highs with his 39 points, 23 assists, 16 goals and 10 multi-point games. His 16 goals were the second-highest single-season goal total by a U-M defenseman and a sophomore defenseman record while his plus-26 rating ranked second on U-M. His 87 penalty minutes were a team-high, he tied for fourth on U-M with four power play goals, he tied for second on U-M with two short-handed goals and he recorded his first career hat trick on January 26 versus Ferris State. During his sophomore season at Michigan, Johnson also played for Team USA at the 2007 IIHF World Junior Championship tournament in Sweden and earned a bronze medal. At the tournament, Johnson played in seven games and had three points (all goals), which tied for the team lead. He was also one of three Kings prospects -- Trevor Lewis (center) and Jeff Zatkoff (goaltender) were the others – who played for the United States as the Kings had the most players named to the squad of any other NHL club. During his first season at Michigan (2005-06), he set a freshman record for scoring as a blueliner with the Wolverines with 32 points (10-22=32) in 38 games. A finalist for the CCHA Best Offensive Defenseman award and a member of the CCHA All-Rookie Team, Johnson also had five power play goals and two game-winning goals while finishing with 149 penalty minutes and a plus-11 rating. Prior to playing at Michigan, Johnson played at renowned Shattuck-St. Mary’s prep school in Faribault, Minnesota. Johnson’s participation in the 2007 World Juniors was not the first international experience of his young career. He was an All-Star selection at the 2006 World Junior Championship where his six points (1-5=6) in seven games helped the U.S. to a fourth place finish. In addition, Johnson has earned gold medals with Team USA at the 2005 World Under-18 Championship, the 2005 Five Nations Tournament (U.S. Under-18 Team) and the 2004 Compuware Four Nations Cup (U.S. Under-18 Team). At Shattuck-St. Mary's Prep he was a teammate of the Penguins Sidney Crosby. Now if only we had a goalie, then I think we are finally headed in the right direction. Next season should be exciting. Below are some YouTube Videos featuring Jack Johnson. Jack Johnson knocks the helmet off the goalie with a slap shot. What more does this guy have to do. He is ready for the big show. Unfortunately, the Dodgers are not ready to keep him in Los Angeles. There are roadblocks everywhere. No room at 1st-base and the outfield is looking crowded. Usually this is a good problem, but I fear that Loney's patience may start to wear thin. "I came here to work hard to help the team win and I can't do that in Las Vegas," he said. This is the second day in a row he has made some disconcerting remarks. Grady Little adds the following. "We have to consider the number of at-bats we'd get James," Little said. "We don't want to slow him down and have him go backward and then something happens here and he has to jump in. He needs to be ready." At the end of the day, it is my belief that the aging veterans on the team will need intermittent rest throughout the season- if not replacement due to injury. In a long Baseball season it is bound to happen. So, even if Loney is sent to Las Vegas now, I expect he will end the season with more at-bats then in 2006. I just hope James understands the plan. In agreeance with SoSG, if Colletti trades Loney, or even welcomes the thought of it, I will go crazy. Fellow blogger Dodger Gal finds a great video of one of our youngest and brightest Dodger fans. Meet Nathan. Oh, and his parents have taught him right. He hates the Giants too! Chris Malone, RHP in the Dodger organization, gives us a personalized tour of Dodgertown. Below is a great video by John McClain giving a tour of Dodgertown. During batting practice, [Grady] Little was heckled by a fan about not removing Pedro Martinez from Game 7 of the 2003 American League Championship Series. Third base coach Rich Donnelly came to Little's defense and the fan was escorted out of the stadium. That guy was screaming and cursing something crazy. Several F-bombs where thrown about by that idiot. You shoulda heard Nomar. He was at firstbase snagging ground balls when he started screaming "kick the guy out. Kick him out!" He then sported a big smile across his face. I'll also add that the usher who personally escorted the unruly fan confessed that the guy was ejected without receiving a refund. I guess there could be worse ways to waste $20 bucks. The usher also had a big smile across his face. 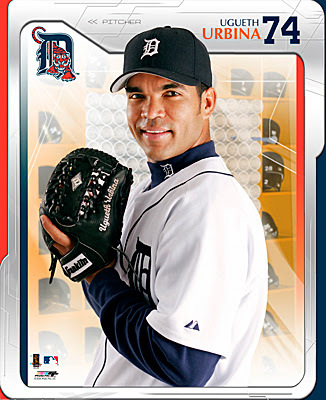 With the recent injury to Fural, hot-hitting Wilson Valdez will get the call for opening day. Valdez had two hits in Friday's game against the Florida Marlins and raised his batting average to .382. "He's a good option for us," Little said of Valdez. "The kid has earned a right." The Dodgers headed down to Fort Lauderdale this afternoon to face-off against the Baltimore Orioles. This game was one I hoped would never come. First of all, Fort Lauderdale Stadium is my least favorite venue. It is a drab old complex. I had heard rumors that Baltimore was considering coming to Vero Beach until the city decided to woo them back. I guess a new stadium is in the works. Finally, this is my last full day in Florida, and since my flight leaves from Fort Lauderdale tomorrow it made sense to make this my last game this Spring. In many ways this is the worst day of my vacation because I know that I will be back in California tomorrow and work starts again on Monday. Vacations never seem to last long enough. Thankfully, the Dodgers where able to see me off with a victory. Dodgers 4, Orioles 2. Randy Wolf was great. He finished with 7 strike outs in 5 2/3 innings. His big slow overhand curveball appeared to stifle hitters. They knew it was coming, but they could do nothing but watch it cross the plate. Tsao, Seanez and Hamulack where perfect in relief. Below, Russell Martin is signing before the game starts. After witnessing the Dodgers lose all five games I've seen this Spring I finally get to see a win. Dodgers 6, Marlins 2. Derek Lowe was sharp after a slow start that saw the Marlins gather back to back doubles and a sacrifice ground ball for two runs in the first inning. Lowe appears ready to start the season. Saito, Broxton and Billingsley were also sharp. Matt Kemp hit a line drive homerun to left centerfield. Hopefully this is a good sign as opening day approaches. Roger Dean Stadium host both the St. Louis Cardinals and the Florida Marlins during Spring Training. It's a gorgeous facility. Below is a photo celebrating the Cardinals World Championship last year. Grady Little decides to play first base as LaRoche takes some grounders from third base. James Loney and Matt Kemp have been the most accessible players this week. Below, James Loney is signing for the autograph hounds. Chin-Lung Hu played a little bit of shortstop this afternoon. Below, he is at-bat. This is a used ticket stub from a 1950's Tour of Japan Baseball game between the Brooklyn Dodgers and the Japanese All-Stars. The graphics on the face are beautifully done with both the American and Japanese flags on the top border. I only wish it was more affordable as it sold at a hammer price of $46.00. Today was a bad day for the Dodgers. As many of you already know, Furcal is out, for the time being, with a moderate ankle sprain. The play looked much worse than that. I was chatting with a friend just as the event developed. I turned to see the pop fly and saw Repko charging hard with Furcal running back. The next thing I know, Furcal leaps, catches the ball and lands on the ground like a fish caught out of water. Repko had dived and appeared to upend Furcal. Raffy was on the ground in obvious pain. All I could say was, "Oh No!" I had a sudden sense of fear that we may lose Raffy for a long period of time. He laid on the ground for several minutes holding his head. I thought he may have also banged his head or neck. Again, all I could do was say, "Oh No!" The entire training staff came out and helped Furcal onto a cart while carefully holding his leg. I was in such a state of shock I plain forgot to take any pictures. At the end of the day, though, this appears to be a situation where you can't believe your lying eyes. Furcal is optimistic about his return and everything may be just fine- given some rest, of course. The only positive out of this is whole ordeal is that Raffy, even in his pain, still caught the ball for an out. Repko must be cursed. He was chasing a deep fly to right centerfield when he fell in a heap. It looked like he dove for the ball, but reports indicate that he lost traction and fell. The dirt out there has gravel that caused Repko to slip as he came running at full speed. Jason got up and looked fine. He even wanted to play on. Fortunately, Ethier came over and started calling for the trainers. Again, I neglected to take any pictures. BTW, this was Repko's first start since his last injury. Below are just a handful of pics from today. Russell Martin is walking up with his equipment bag. Today was elementary school day. There were hundred of little tykes in bright colored t-shirts taking the day off from school. Below, Nomar is signing for the kids. The kids were also loud. You could hear chants of "Let's Go Dodgers" throughout the game. It was a nice departure from the typical quiet crowd at Holman Stadium. Below are some photos I took this afternoon. Derek Lowe working with Jon Broxton. Broxton has not been sharp his past two outings. I believe he was working on his release point, but don't hold me to that. Steve Lyons and Russell Martin are in the middle of some filming. It looked like it may have been a instructional video shoot. Maybe this will be a program for Dodgers On Demand. Below, Steve Lyons and Jeff Kent are out on the field for some filming. More pitchers at batting practice. Rick Honeycutt watches over Derek Lowe. Maury Wills is giving an interview. Steven Lyons is more than happy to sign for fans. Dodgertown would not be the same without Manny Mota riding around on his bike. The Mets at batting practice before the game. Kuo is warming up before the game. I was able to catch a little bit of Jason Schmidt pitching a simulated game yesterday afternoon. The scoreboard gave me a big laugh during the game with the Cardinals. It is the bottom of the ninth and the Dodgers are down 13 to 0. Dodgers vs. the Nationals at Space Coast Stadium. Matt Kemp signing for fans after the game. Space Coast Stadium is one of my favorite places to see a game. The crowds are usually small and the stadium is very fan friendly. It is also a very accessible venue for autograph hounds like myself. On this day Grady Little, Ramon Martinez, Matt Kemp, Takashi Saito, Jeff Kent and Nomar Garciaparra signed a ball for me. What a Day! This ranks as one of the best autograph days I have ever had. I'm pinching myself as I write this just to make sure I wasn't dreaming. I can't wait til I can redecorate my office with these jewels. Unfortunately, the Dodgers fortunes were not as good as mine. They got shelled and lost 9 to 1. Randy Wolf started the game and was a little shaky, but was able to work himself out of several jams. Broxton just couldn't get the ball over the plate and gave up 5 runs without getting an out. Dessens came in to relieve Broxton, but the damage was already done. Saito was great in his one inning of work. As I walked out to my car I passed a Dodger fan as she was folding her blanket. She turned to me and said, "It wasn't a good day." I remarked, "at least it's just Spring Training." Feel free to check out my photoalbum for more pictures from Spring Training.